I bought this book for my boyfriend several months ago. He loved it, so I thought I would give it a try, despite being rather annoyed at the whole preponderance of the zombie genre (it’s totally not my thing, although I do fully intend to read Pride and Prejudice and Zombies one day, just so I can say I did). As it turns out, World War Z was actually pretty awesome. 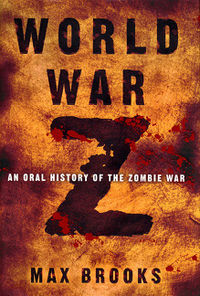 As it says in the subtitle, World War Z is the oral history of a fictional zombie war, compiled by an unnamed narrator. The interviews all show a different facet of the war—there are civilian, military, and medical standpoints from all over the world. That’s about it for an actual summary; since it’s supposed to be “history,” it doesn’t follow a traditional novel storyline, really. At any rate, World War Z has quite a few things going for it, its hugely imaginative premise (not the zombie thing, but the history-of-the-zombie-war thing) and fantastic writing being the top two. As with most avid readers, I’m sure, I’ve always felt that a great plot can only survive on its own so long without good writing to support it (see: The Hunger Games—after a while, the choppy, fragmented writing style just irked me), but World War Z didn’t have that problem at all. I was glued to it while I was reading. Now, if only more history textbooks were written like this, I might have actually been interested in/done well in history in school. It was a little difficult to keep track of all the names of people the narrator interviewed, if only because there were so many unfamiliar foreign names. But that was literally the only thing I could complain about with this book—everything else was incredible. Everything was told with an eerie sense of reality, and the amount of research he must have done for all the military sections, which were all pretty technical, is considerable. Even the amount of geographical research he must have done is mind-blowing. You’re really able to get a sense of complete and total war. Even as someone who is really not into zombies at all, I found this book utterly captivating. Anyone who wants a good scare and an awesome view of what history just might be like post-zombie-war should definitely give World War Z a try. This is my favorite zombie book. The one that got me into reading zombie books, which I was never really into despite loving zombie movies. I grew up watching the "Night of the Living Dead" franchise movies. I think a close second would be the Newsflesh series by Mira Grant. Just the word Newsflesh gives me the willies! I'm not a huge fan of zombie anything, really, so I was surprised to like this, but I thought it was great! Interesting! I have read a few zombie books, but none that sound like this. I'm interested in checking it out, for sure! I hope you like it! It's so good! Sounds great - but that's what I thought already: I have a copy of the book, but the reading of it gets pushed forward the whole time. I must read it soon! I wonder if you've read The Passage by Justin Cronin - that's vampires but the kind of vampire book for people who are not into vampires (like me). Brilliant story. I read it and liked it. It was more of a clincal interest to see what happened and how the author would wrap it all up and make it work. You really should give Pride and Prejudice and Zombies a read. I absolutely loved that one. It's on the bookshelf just waiting to be read! We've got Sense and Sensibility and Sea Monsters as well--have you read that one? I absolutely loved this book when I read it. It was such a different way to tell a story, let alone a zombie story, y'know? Glad you liked it. I heard that they were making it into a movie, too! I finished the book a couple of weeks ago, and I absolutely loved it too. The most terrifying thing about that book was really the insane amount of research that the author must have done. I mean, just the small things and the small differences between the countries - things that I wouldn't notice if they were wrong. I never thought I'd find that kind of book so hard to put down. I really enjoyed the "post-war" premise of the book. The writing was great. I'm thinking of picking up the audiobook, though I don't really listen to books, I keep hearing that it's amazing because of all the different voices. Also, Pride and Prejudice and Zombies is a lot of fun. I hadn't heard anything about the audiobook (I don't listen to books either) but now that you mention it, it does sound as though it would be very interesting since it is an oral history after all...this would probably be one of the few books I'd actually be interested in listening to! Yay! It's a quick and fun read, so if you're reading any monster books right now and need a break, World War Z would be a good bet! Oh no! Another positive review, lol. My friend wants me to read this one. Sigh. I may have to now. Try it! :) I hope you like it! I read it when it first came out. I loved it. Your review makes me want to re read it. I almost want to re-read it too, after responding to all these comments! :) Someday soon haha!